Chapter 1 – James told us to consider it joy when we face trials because trials test our faith and the process of testing our faith brings us to maturity and makes us into the kind of people we should be. Chapter 2 – James argued that if we have saving faith and genuinely believe the gospel, it will change the way we think, the way we live, what we value and who we are. Chapter 4 – James begins the conclusion of the book which is a call to repentance. As he calls for repentance, he returns to his 2 main examples of the kind of change repentance should bring about in our lives. Our speech and they way we handle wealth. Faith is a matter of the will in the sense that we believe what we want to believe. Scripture emphasizes responding to the gospel by believing it. What we believe is reflected in the way we live our lives, how we speak, how we act and what we value. Testing our faith reveals what sort of person I really am and whether I in fact believe what I say I believe. Testing our faith leads to maturity and growth. Each of us must choose whether to believe or not and we all face situations where we must choose to act on those beliefs. In the end of chapter 4 he sums up his warnings about speech and now in chapter 5 his sums up his warnings about wealth. He gives three pieces of evidence of that they are trusting in their wealth: 1) hoarding (5:2-3); 2) not treating employees fairly (5:4) and 3) self-indulgence (5:5). There’s a difference between hoarding and planning for your retirement. The opposite of good stewardship is NOT ownership, the opposite of good stewardship is embezzlement. The problem with hoarding is not that you are saving; it’s a question of who do you trust. The way wealth is gained, the way it is used and the way its valued all reveal whether we are counting on the things of God or the things of this world. James begin his letter with a call to remain steadfast through trials and he comes back to that theme here: be patient through suffering (James 5:7-11). The farmer’s experience reminds us of life’s seasons. Job’s experience paints a picture of pain in chaos. Both are circumstances that require us to trust God. 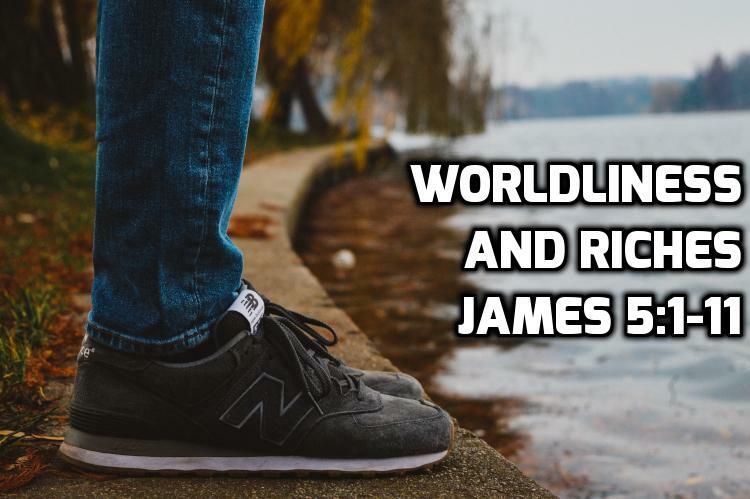 Next: 12 James 5:12-20 – Physically ill or spiritually weak?